Thrusters are the primary means that ships use to move around. Thrusters only provide direct linear thrust in the direction away from the nozzle. Regardless of their physical position on the ship, they will not apply any torque or cause any rotation of the ship. (see Gyroscope). As long as the thruster is directly connected to the Grid (not a sub-grid or attached via Landing Gear), they will provide thrust from the center of mass so there is little restriction on placement. There are three types of thrusters: Atmospheric thrusters which are electrically powered and only work in the atmosphere of a planet, Ion-based thrusters that use electricity and work in vacuum, and powerful Hydrogen thrusters which require Hydrogen as a fuel. All standard Electric-based Ion thrusters will consume a minimum of 0.002 kW (2 Watts), even when not in use. They use electricity to generate thrust, their power consumption scales linearly with what percentage (as seen on the thrust override slider) the thruster is operating at. It's effectiveness is inversely dependent on the density of the atmosphere, having an actual effectiveness anywhere from 30% at minimum to full effectiveness outside planetary atmospheres - becoming increasingly less effective the thicker the atmosphere. All Hydrogen-based thrusters require a Conveyor connection to a source of Hydrogen such as an Oxygen Generator or a Hydrogen Tank. (*) Hydrogen based Thrusters despite having a 'power consumption' rating will not actually consume electrical power they ONLY consume Hydrogen from a hydrogen source accessed via conveyors. Their only electrical requirements will be for the hydrogen sources that store or make hydrogen and the Conveyor system. Each Hydrogen Thruster consumes a tiny amount of Hydrogen even if not active (as seen with its 'pilot light'), much like the minimum that electric-based thrusters have. Their effectiveness is entirely unaffected by the presence of planetary atmospheres, being equally effective everywhere. All atmospheric thrusters thrust output is entirely dependent on the density of the atmosphere around the thruster and only work in planetary atmospheres, being most powerful near the surface and becoming linearly less powerful further out. Typically the thruster will never achieve it's rated maximum during usual play even directly on the surface (which is typically around 90% max efficiency). They much like standard thrusters use electricity to function and consume a minimum amount of 0.002 kW (2 Watts) even when not in use. Example: 1 Large Atmospheric Thruster on a small ship has a force magnitude of 408,000 N and an effectiveness of 90% at sea level. Where 9.81 m/s² = 1.0 g on Earth. a[curr] = (4 * 408,000 * 0.9) / 120,000 kg = 12.24 m/s² > 9.81 m/s² ===> will fly! the ship will be able to hover and fly. This value decreases linearly with the decreasing air density in greater heights. The air density is different for each planet type. Online calculator to calculate the thrust at planets and moons. One should also keep in mind, that depending on the ships orientation during maneuvering, not all downward thrusters will actually contribute 100% to the ships lift. due to insufficient lateral thruster force when rolling the aircraft too much for example. So this should be calculated or tested before actually finishing a ship design to prevent a bad surprise. The "x5" / "x10" inventory setting will also have an effect on the calculation. 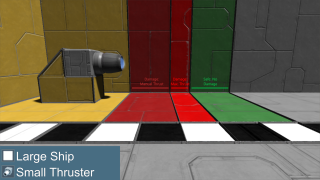 The game will divide the cargo mass by the set inventory multiplier when calculating thruster lift. So a cargo mass of 100,000 kg will only count as 10,000 kg if "x10" inventory multiplier is set. This means, a ship with atmospheric thrusters can potentially lift 10 times more cargo mass with the same thrust than it normally could, if a "x10" inventory multiplier is set. However, the right HUD panel when inside of a ship doesn't correct the cargo mass to reflect the mass taken into account for lift. the panel will show 200,000 kg of mass while in reality it will take only 110,000 kg (ship mass + cargo/10) of mass into account for calculation of lift ability. 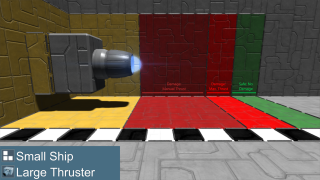 If 'Thruster Damage' is enabled for a map or server, thrusters will deal damage while active to any blocks directly behind within a certain distance with exception to small thrusters damaging large ship blocks, making it possible to build 'landing pads'. If this occurs, blocks adjacent to the block/s in "the line of fire" will also be damaged in a cross-pattern. If the block is too close to the thruster, this can even damage the thruster, causing it to explode. The "danger zone" varies in size based on the thrust being applied by the thruster. Large thrusters deal damage further than small thrusters. Likewise, thrusters on large ships deal damage further than those on small ships. This table (and the images below it) indicate the damage distances for small and large thrusters and ships. 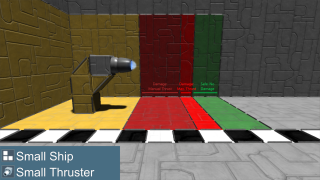 They apply only to blocks directly behind the thruster, and do not account for damage to adjacent blocks. All thrusters from standard thrusters, hydrogen and Atmospheric deal thruster damage to varying degrees if enabled, generally the more powerful the thruster the larger the danger zone becomes. 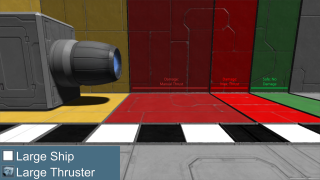 Before Update 01.105, Thrusters used to have two specific modes: a normal thrust and the inertial dampening thrust. Normal Thrust that is used when manually piloting with the keys and mouse or using the thrust override slider and an dampening thrust that is automatic providing 10x more force for 50% more electricity consumption. All Thrusters from large to small when inertial dampening is on and the ship is moving, will kick in and attempt to slow the ship to a stop. Due to this, ships were much more able to come to a complete stop than they were able to accelerate before that update. Before Update 01.107, all Small Ship thrusters would receive a 5x boost to thrust when under the automatic control of inertial dampeners (not the player or 'thrust override') attempting to stop the ship, for no increase in both power usage or fuel usage. Currently all kinds of thrusters (whether small or large ship) do not have any special super-dampening capabilities beyond their rated maximum thrust and power consumption. This page was last modified on 5 March 2019, at 16:31.